We all know a walk is good for you. The quintessential low-impact, no-equipment, accessible exercise, it’s as old as human life itself, and unlike some of the other modern physical activities we’ve adopted – think bungee jumping or even scuba diving – there’s no question we were made to do it. But for some of us, all the encouragement to walk might be getting tired, and can’t all that strolling around get, well… boring? Autumn is the best time for walking. You’ve got scenery, weather that’s not too hot or cold, and the gratitude that comes from savoring the last snow-free days. Go somewhere especially pretty to walk – a park you don’t usually hit, the woods, a path along the river. Finding a route that’s a trail rather than concrete can add to your chance to experience natural beauty, and give you more ankle strength. If you’ve been doing this awhile, then step it up, literally. 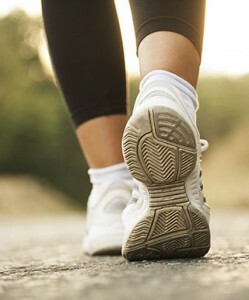 Walk as briskly as you can without running for one minute, then walk your “regular” pace for the next minute. After six to eight minutes, shorten your “regular”-paced segment to thirty seconds. Then start putting in a minute here and there of jogging. Other additions: walking lunges, high knee lifts, side-squatting down the length of so many sidewalks squares, and side shuffles. If you have a walking partner already, get creative about your conversation topics – one person picks and the other person talks on that subject for two minutes, then switch. Start a walking group at work or in your neighborhood. Walk to someone’s house, chitchat over a glass of water, and walk back. Have a quick meeting with one or two other people? Grab a small pad and pen and take folks walking while you talk. Instead of having wine and cheese, get your book club to walk while discussing the merits of theme and character. Music, MP3 books, or making phone calls for business or pleasure can help you change up your walk. You can also use apps or pedometers to measure routes or steps, and timers or alarms can signal when you should speed up or slow down for interval or personal best work.